A sample of the kind of furniture offered at benefit auctions in Ohio's Amish country. 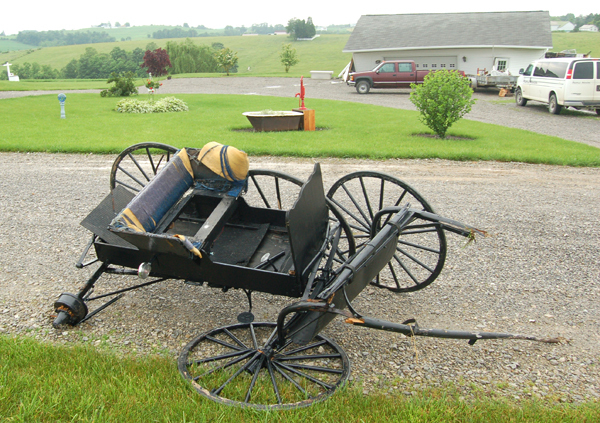 Benefit auctions abound in Ohio’s Amish country. Every year thousands of people from near and far attend these worthwhile functions. Dave Kaufman of Kaufman Realty, Sugarcreek, serves as auctioneer at many of the benefit auctions. He’s not surprised at the popularity of the events at all. He said the formula for their success is pretty simple. Kaufman estimated that there are at least 35 such benefit auctions in Amish country. Some are small, local auctions, like the ones for private Amish schools. Others draw big crowds and usually raise major money for their causes. One of the largest benefit auctions is the Rainbow of Hope Auction in Mt. Hope. Henry Hershberger is its president and founder. This year’s sale is July 23 and 24 at the Mt. Hope Auction barn. The sale has been a local mainstay since 1987 when Hershberger’s young daughter was hospitalized for two months. Hershberger is Amish and along with other members contributes to the church’s medical fund. But in this case, the fund was depleted before the bills were paid. Hershberger turned to the community for help, which responded by raising the $20,000 balance of his medical bills. Touched by the generosity, Hershberger started the auction as a way to help others who might be in a similar situation. “Our best auction was in 2008 when we totaled $403,735,” Hershberger said. He rattled off that figure from memory. Like most other benefit auctions, Rainbow of Hope Auction depends on volunteer labor and donations of items for a successful sale. With furniture the biggest moneymaker, Hershberger said that the work of the furniture committee is key. 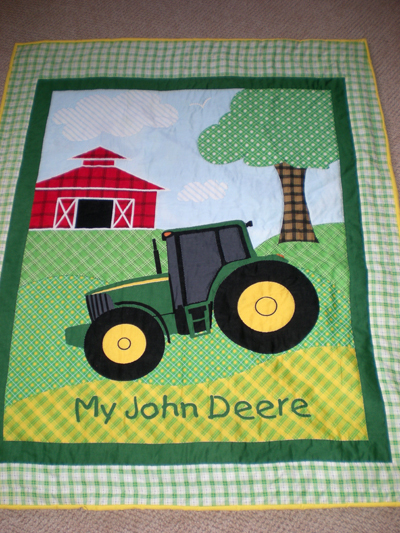 Quilts like this one are often found at the benefit auctions held each summer in Ohio's Amish country. Hershberger said they also auction quilts, gift certificates and other home and garden items. Hershberger stressed that the Rainbow of Hope fund is not just for Amish. Hershberger said the Rainbow of Hope fund has never run out of money either. He said the committee uses two percent for overhead. “The other 98 percent is used for those who need it,” Hershberger said. He has served as chair of the auction for 20 years. Another popular benefit auction is the Ohio Mennonite Relief Sale, which will be held August 6 and 7 this year in Kidron. Last year, the sale raised $338,653 for Mennonite Central Committee (MCC). MCC is the relief, service and development agency of North American Mennonite and Brethren in Christ churches. Several such sales are held throughout North America annually. 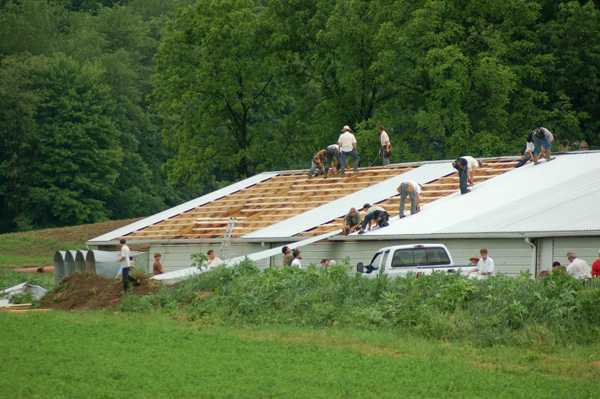 The Ohio Mennonite Relief Sale is typical of those auctions. 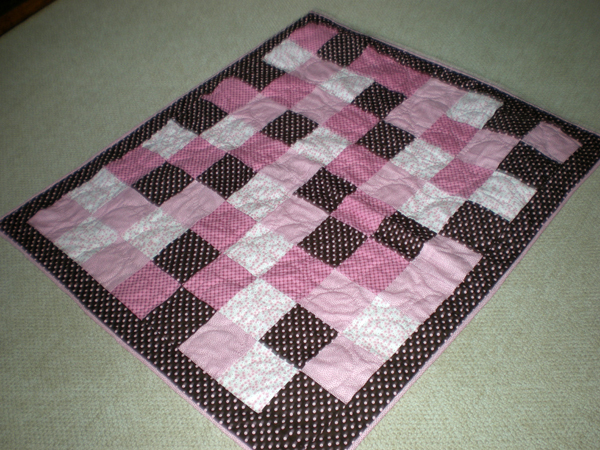 A baby quilt typical of the kind auctioned off. My wife, Neva, made this one for our granddaughter. Once again, the Ohio Mennonite Relief Sale will feature a varied schedule of events. Everything from food to children’s activities to the auction items themselves will be included. Even a USA Track and Field certified Run for Relief will be held to help raise money for MCC projects worldwide. Another big benefit auction in the area is the Ohio Haiti Sale, also held at the Mt. Hope Auction in Mt. Hope. This year’s sale, which will have special meaning given the catastrophic January earthquake in Haiti, will be held on Labor Day weekend, September 3 and 4. 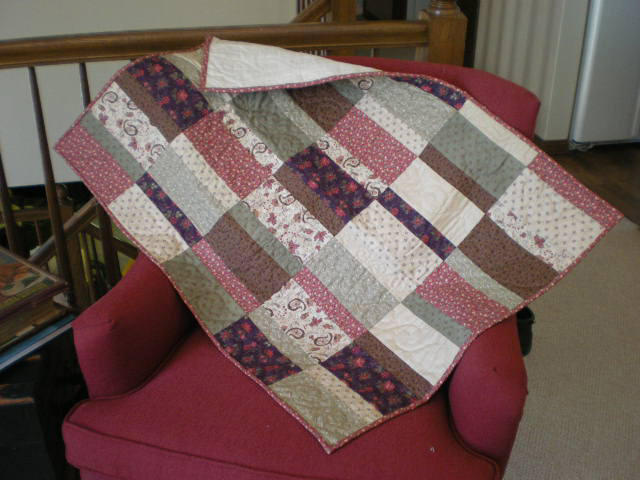 This is another example of the kinds of quilts available at charity benefit auctions. This sale is also one of several held around the country for the benefit of those in need in Haiti. The Ohio Haiti sale was also begun in 1987. It, too, takes a coordinated effort of many volunteers and donated items to raise funds. Food, fun and fellowship enhance the actual auctioning of items at the Haiti sale, just like all the other benefit auctions that predominate the summer months annually in Ohio’s Amish country. This article first appeared in the June 2010 edition of Ohio’s Amish Country. I am not an impatient person. But I hate waiting. For me, that is not a contradiction. There is a gulf between waiting and impatience. Delays in life, often inconvenient, are inevitable. New York City cabbies, with their persistent honking, are not my model for waiting. When my son had surgery last week, waiting became part of the routine, more than either my wife, his wife or I cared to tolerate. His surgery was scheduled for evening one day, then postponed until early afternoon the next and yet delayed again. It was frustrating. But when you are at the wrong end of the scalpel, what choice do you have? That state pertains to concerned family, too. When you are assigned to a room appropriately labeled “Waiting 1,” that’s what you do. Time seems to stand still. You feel stuck in an institutional time warp. The hospital tried to accommodate relatives in 21st Century style. Each family was given a four-digit tracking number for confidentiality purposes. In turn, that number was displayed on a blue and white lined electronic board in proximity of each family waiting area. It was like checking the status of a flight at an international airport. I grew a little anxious when my son’s number didn’t even appear long after he had been taken to the operating room. Finally when it did, the message simply indicated the original time of his surgery, information that we knew was inaccurate. The sign continued to display numbers of other patients who were at various stages of their surgeries. Impersonal but efficient “Patient in OR,” “Patient out of OR,” and “Surgery start time” scrolled by in herky-jerky fashion. About the time his surgery should have ended, the waiting room phone rang. It had rung earlier for other families, indicating that their family member was either going into surgery or was in recovery. Our lovely daughter-in-law took the call. Wives always trump fathers. That’s life’s pecking order as defined in Robert’s Rules of Order or Hints from Heloise or Emily Post. “He’s just now going into surgery,” our daughter-in-law said puzzled. We waited some more. My wife called us for an update on how the surgery had gone. I had to tell her that the surgery had just begun. She arrived in Waiting 1 a half-hour later, and joined the Team Waiting. We surfed the web via the free Internet service. We chatted quietly and took a few phone calls. And we waited and waited. It was supposed to be a simple, in-and-out type surgery. In our hearts, we knew no surgery was indeed “simple.” Silent prayers were offered, and yet we waited far longer than we ever imagined. Finally, nearly four hours after his original surgery start time, the sign said, “Patient out of surgery.” But we waited for human confirmation. Shortly before 4:30 p.m., the surgeon informed us that Nathan’s gall bladder was so badly inflamed that an incision had to be made instead of the planned laparoscopy. Nathan was fine, but he would be in the hospital three to four more days. Our wait was over. Only now another had begun, a wait that hopefully, would be more tolerable. We all were anxious to see Nathan, to hold his hand and hear him complain. For that happy reunion, we had to wait another long 30 minutes. But I would have waited a lifetime. 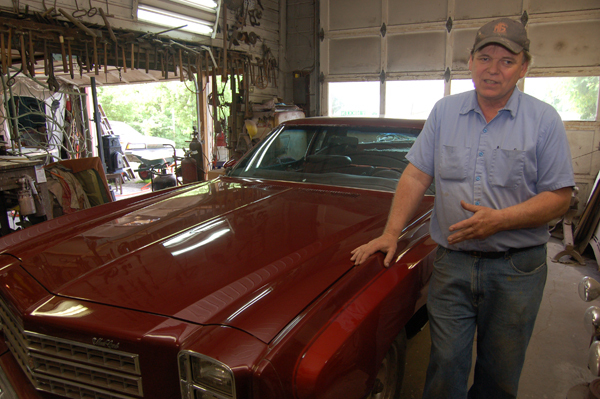 Glenn Wengerd showed off one of the many cars he has restored. Glenn Wengerd, 61, is about as unassuming as a person can be. Dapper, sophisticated, egotistical are words that would never describe him. That is just fine with the Winesburg native. Wengerd is as down home, easy going and likeable of an individual as you will ever meet. Of course, Wengerd would be too humble to say such things about himself. But that is typical Glenn Wengerd, too. Wengerd remembers riding his tricycle up and down the sidewalks of Winesburg as a toddler, and being teased by some of the town fathers. “The old-timers would stop me by putting the hook of their canes into my bike’s spokes,” he recalled with a chuckle. Later the “old-timers” would visit him in his restoration shop just to sit and chat while he worked. Glenn Wengerd displayed his latest restoration project, a stove for a local museum. profession, he restores antique cars and other assorted old items. Putting the finishing touches on an old potbellied stove for the German Culture Museum in Walnut Creek was his latest sidebar. He restores antique toys and bicycles as a hobby. Wengerd even dedicated a rather large room in his 1897 residence on Main Street to house all his entertaining restorations. He holds open houses occasionally, including this coming September during the Winesburg Reunion, which happens every five years. It is here where Wengerd really shines. He devotes untold hours helping the little town preserve itself for current and future generations to enjoy and appreciate. He has served as either President or Vice President of the Winesburg Historical Society for 25 years. “The funny thing about that,” Wengerd said, “was that I agreed to join if I wasn’t an officer.” The group waited until the second year to name him their leader. Prior to his deep involvement with the historical society, Wengerd served as president of the park board during the early development of the town’s recreational park. Today he gets a quiet contentment out of seeing people enjoy the shade of the trees he helped plant. Wengerd’s roots go deep into the history of Winesburg. He owns the property his grandfather bought in 1949. His restoration shop was the chicken barn and carriage house. 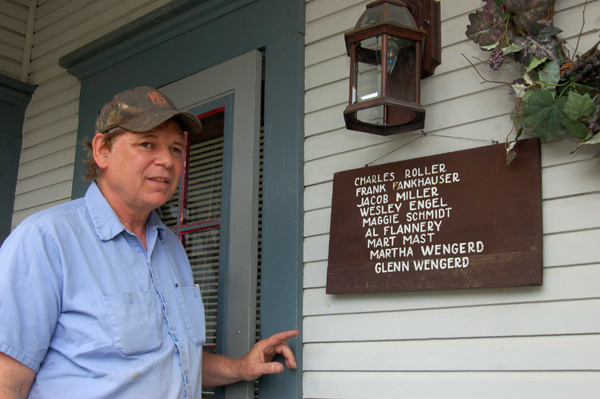 Glenn Wengerd stood by the plaque at his front door that showed all the owners of his 1897 home in Winesburg, Ohio. As a child, Wengerd marked up the walls of his grandparents’ home with his tricycle tires. Now he lives in that same beautiful home, and according to Wengerd, he regrets being so reckless with his trike. When Roller discovered his last name on the plaque that lists the past owners of Wengerd’s house, he inquired within. He went to the right person. The Rollers were among Winesburg’s first settlers. Nelson is likely a descendent. Wengerd’s restoration efforts, however, go far beyond his own business and home. He has lead the effort through the Winesburg Historical Society to restore and relocate an old log cabin, Peter’s School and replicate the town’s original bandstand. All are set in a small park across from the town’s fire station. 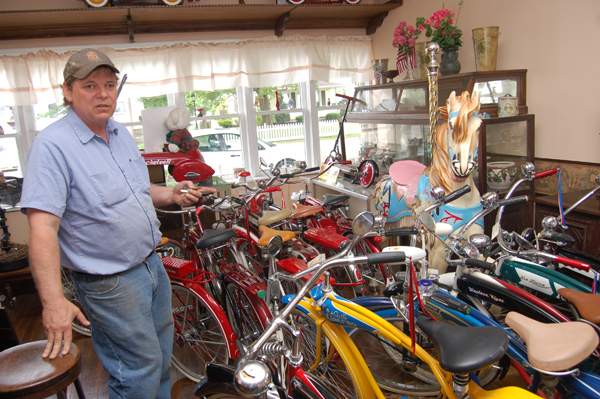 Glenn Wengerd restores toys and bicycles, which he has on display in his home. Restoring the 1861 German Methodist Church building is the next project on the horizon. Wengerd said the historical society would like to see this undertaking completed in conjunction with the 150th anniversary of the U.S. Civil War in 2011. Dedicated as he is, Wengerd certainly doesn’t see his time, hard work or the interruptions as a bother. Just the contrary is true. Of course, Wengerd entertained their questions and invited them back for the reunion. That’s just the way Wengerd is, and Winesburg reaps the benefits. This story first appeared in the Holmes Bargain Hunter on June 21, 2010. I remember the catalpa tree that grew across the street from my childhood home. I had no idea that such a tree had a brief but pinnacle part in the history of our family until my late father related an unforgettable story to me about this time last year. We were on our way to one of Dad’s numerous doctors’ appointments regarding treatment for his aggressive cancer. I drove. Dad rode shotgun, while his walker took the backseat. During each trip to and from the doctors, Dad would tell me many stories about his past, the family, or complain about his Cleveland Indians, the team he loved to hate. If Dad weren’t feeling particularly well, he would ride along silently, head turned gazing out the passenger window. He might speak up if something caught his fancy, like a field he thought would be good for hunting arrowheads. On this particular trip, Dad was quiet until he spied a catalpa tree. 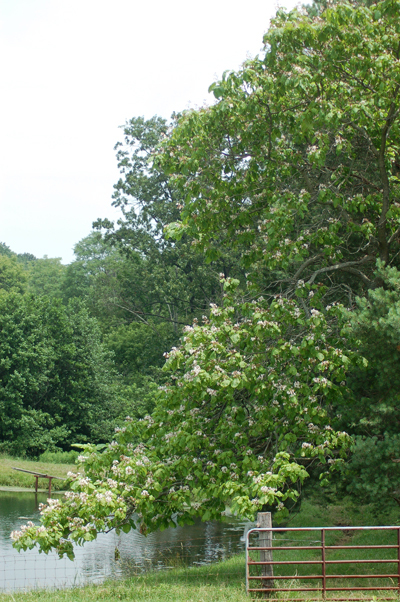 The fading blossoms of a catalpa tree overhanging a pond. I assured him that I remembered the tree. We called it the cigar tree because of the elongated, greenish-brown seedpods that it produced. The tree’s broad canopy loaded with big, lobed leaves provided plenty of shade. We lamented, however, that it grew so close to the road. Its blossoms were large, white and fragrant. “I remember the Sunday your Grandpa and Grandma Frith visited us,” Dad continued. By “us” he meant Mom, my older brother and himself. I was six months along in my mother’s womb. It was June 1947. While sitting on the porch of my parent’s first home that Sunday afternoon, my grandfather saw a tree in full bloom that he didn’t recognize. Grandpa asked what kind of tree that was, and Dad told him it was a catalpa tree. “I’ll never forget that day,” Dad said, “because after visiting with us, he and Grandma also visited with Aunt Gerry and Aunt Vivian.” They were my mother’s sisters, who also each had a child. Dad’s voice softened as the thoughts played out in his mind. “I was always so glad they had done that,” Dad revealed with rare emotion, “because the next day was when Grandpa Frith was killed.” My grandfather was an electrician and had been accidentally electrocuted on a worksite. I knew the electrocution story by heart. But I never knew of the fateful Sunday afternoon visits. The other day I happened to see a catalpa tree in full bloom. It was tall with an impressive crown and full of showy white blossoms, just like I remembered from my childhood. I smiled, and fondly if not sadly thought of both my grandfather and my father. Dad had taught my brothers and sisters and I a lot about life. Foremost in his teaching was the importance of family. Now, whenever I see the catalpa’s showy white blossoms, I will be forever reminded of that poignant lesson, and eternally thankful that Dad had related that personally valuable slice of family history. Jr. Schlabach sprays his secret barbeque sauce onto the chicken as it cooks. Henry Schlabach, Jr. knows a thing or two about barbequing chicken. He should. He’s been at it for 45 years. The 72-year-old Schlabach, who lives between Berlin and Millersburg, seems to get as much satisfaction from helping his customers as he does making the chicken. Schlabach’s reputation for preparing excellent barbequed chicken has spread far and wide over those many years with some customers coming from 60 miles or more. He mainly grills chicken for families, organizations and wedding receptions. Schlabach said he normally barbeques an average of 10,000 chicken halves a year. He has relied solely on word-of-mouth advertising. 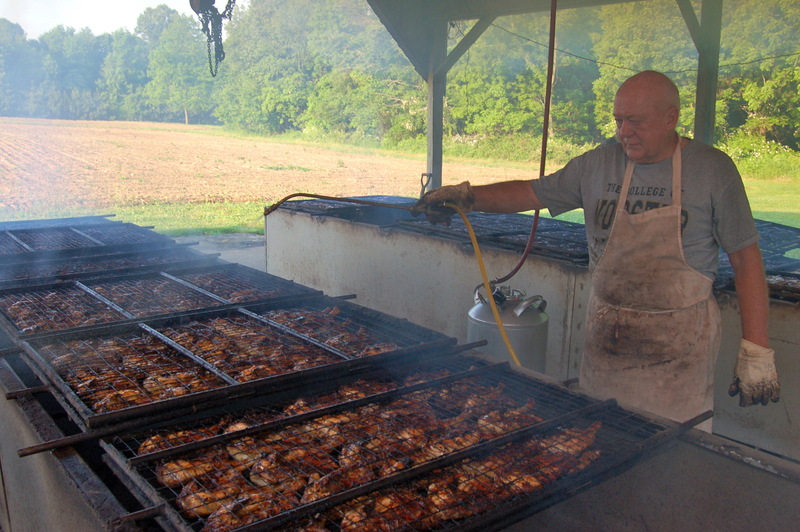 For Schlabach, the season for barbequing chicken runs from April through November. Not surprisingly, he is particularly hectic around holidays. On the Saturday of Memorial Day weekend, for example, he was busy barbequing 740 chicken halves and 300 chicken quarters. Schlabach said he usually barbeques the chicken in batches of 500 halves at a time, 25 halves to a rack. “That takes us four to five hours to do that many,” Schlabach said. Of course, Schlabach doesn’t take on all this alone. His sons, Tim and Mark, help out. They started helping him by making the sauce when they each were around 10-years old. Today, they are grown men with families themselves. Now the grandsons have joined the crew. “I couldn’t do it without their help,” Schlabach said. If an organization orders chicken, representatives from that group also assist in the hot and sweaty production. Grandson Charlie Schlabach said he likes to help for three reasons. “I get paid, it’s fun, and we get to eat chicken, too,” he said with a smile to match that of his grandpa. The Memorial Day effort was a combination fundraiser for the Walnut Creek little league team and making chicken for high school graduation parties. The crew gathered at 5:30 a.m. to begin so they could be completed by mid-morning. Schlabach started his chicken barbequing with a portable pit on a trailer. “We could only do 150 halves at time with that,” he said. Schlabach has progressed to two roof-covered barbeque pits built behind a garage near his residence. Schlabach began his barbequing career for the Shreve Businessmen’s Association that sold barbequed chicken at the Wayne County Fair. At that time, Schlabach ran a restaurant in Shreve. “The guy that was supposed to make the chicken quit doing it,” Schlabach explained. “I don’t know why they called me to do it, but they did.” That first year he made 750 halves. Last year they sold 10,000 halves at that fair. Schlabach said he uses a combination of vinegar, butter, Worcestershire sauce, salt and water, though he didn’t provide the specifics of the recipe. He still uses the original wire-meshed racks that were locally made to barbeque the chicken. Schlabach is picky about the charcoal he uses, too. He drives to Brookville, Pennsylvania and buys a season’s worth of Humphrey Charcoal. He said getting the fire hot, and then turning the racks with the cooking chickens is the key to ensuring good chicken. Of course, spraying the sauce with pressure sprayers is just as important. The most chickens ever done by Schlabach at one time was 2,000, which took about eight hours to complete. With the demand for barbequed chicken growing, Schlabach has seen a lot of competition come and go over the years. This year, he said, there aren’t so many people making chicken. “It’s just plain hard work,” he said, wiping sweat from his brow. He thinks the craving for chicken in the area could possibly be due to the high number of benefit sales conducted locally. For the record, the Walnut Creek baseball team sold all their chicken. That’s what Jr. Schlabach wanted to hear. For him, all the effort he put into the day, even with its early start, was worth it. And as a bonus, he got as much satisfaction from working with his family as he did barbequing his famously delicious chicken. This article first appeared in the June 14, 2010 Holmes Bargain Hunter. Roy Weaver bastes his fillets as they cook. A trio of local Amish country grilling aficionados shared a few tips on how to ensure your summer grilling efforts are successful. Here’s what they recommend. This may sound pretty obvious, but with today’s varying diets and preferences, there’s a lot to pick from. According to our local experts, you can grill your entire meal if you want. Rueben Erb, owner of Sugar Valley Meats, Sugarcreek, Ohio, Roy Weaver, general manager of Weaver Furniture, Sugarcreek, and Ray Haas, owner of Shreve Custom Meats, Shreve, Ohio, each had excellent suggestions for successful grilling. In fact, Haas posts recipes online. What you grill, including vegetables, all depends on your personal preferences. But they all agreed that planning is the important first step. Another step that gets overlooked is preparing the food. Too many people simply want to light the fire, throw the meat on and take it off when it looks like it’s done. There is a lot to do before ignition. Weaver is extremely particular about how he prepares his fillet. Just ask Erb. 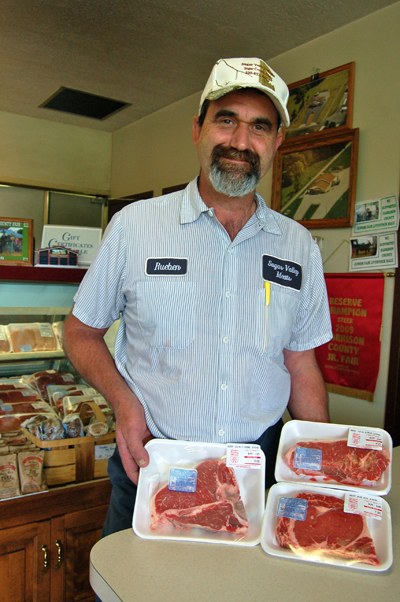 Rueben Erb of Sugar Valley Meats, Sugarcreek, OH, recommends well-marbled meats for grilling. “I have people ask for ‘Roy’s cut’ all the time,” he said. When they do, Erb knows exactly what they want, a two and a quarter inch thick piece of well-marbled fillet. Besides how it’s cut, Weaver follows a lockstep method of seasoning the fillet. 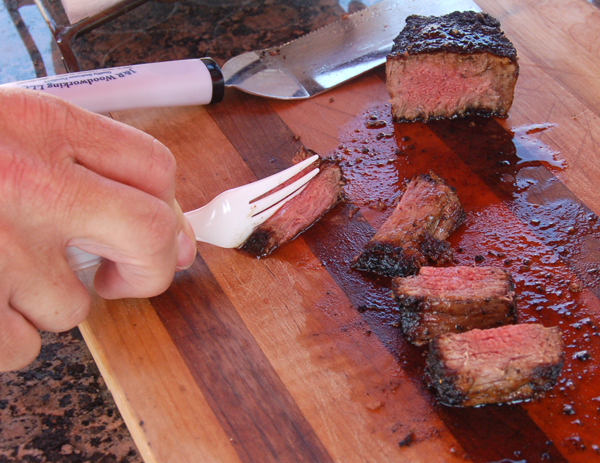 “Meat should always be at room temperature before you season it and definitely before you grill it,” Weaver said. Once it’s ready Weaver adds his own sequence of herbs and seasonings. He continues the seasoning during cooking, along with basting the meat with melted butter. The result is what he refers to as a crusted steak. Haas’ approach is more basic. He just uses garlic salt to season his sirloin steak, a cut he said is overlooked by many people because it is generally a cheaper cut of meat. 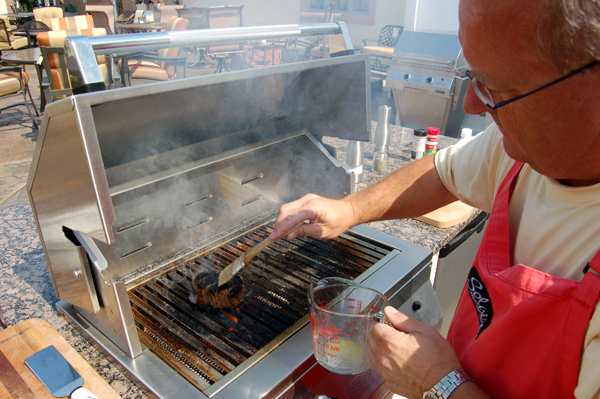 With the advent of gas grills, people turned to rubs and liquid barbeque sauces to add flavor, according to Erb. He said that skinless chicken breast should be marinated prior to grilling, while chicken with skin should have the sauce applied during the cooking. To ensure both excellent results and safe cooking, Weaver said it is important to use the correct tools when grilling. For example, Weaver uses two different wood cutting blocks when he grills, one for preparation, the other to use for the cooked food. He also uses tongs to turn the meat with ease. A sharp knife, stainless spatula, a brush for basting, a timer and an apron are always at his ready, too. Erb said using a meat thermometer is essential to know that whatever you are cooking is hot enough at its center. In today’s grilling world, there are lots of choices. Our three experts each had their own preferences. Erb prefers to grill using a wood fire, even though it takes up to two hours to get the fire hot enough to cook. He uses hickory or apple to get that smoky flavor in the food that gas grills can’t provide. Haas enjoys a mix of charcoal and wood for his grill, also for added flavor. Weaver uses an infrared grill, which he preheats the grill to 1,800 degrees Fahrenheit before putting on the meat. 5. Properly grill your food. Regardless of which method you choose, half the fun is in the grilling. All three agreed that time and temperature were critical in ensuring that the other half, eating, was as much fun. The methods vary according to meat selection, the fire you have chosen and your own personal preference on how well you like your meat, chicken or fish cooked. Each advised grilling vegetables in aluminum foil. Use salt, pepper and olive oil to season the veggies and keep them moist. Weaver said it is important to watch the vegetables so they don’t overcook. For fish, Erb recommended taking the fish off once it begins to flake. Whatever your taste palette desires, summer is the time to satisfy it by grilling. Following simple but important steps can make your efforts all the more enjoyable. This article first appeared in the Holmes County Bargain Hunter, June 14, 2010. Fresh strawberries ready for the fresh out of the oven shortcake. 2. Beat two eggs in mixing bowl. 3. Add one cup of sugar and one teaspoon of vanilla and beat until light. 4. Combine separately one cup of flour, one teaspoon of baking powder and 1/4 teaspoon of salt. 5. Fold dry ingredients by hand into egg mixture. 6. Bring to boil in a small saucepan 1/2 cup of milk and one teaspoon of butter/margarine. 7. Add this mixture slowly into the batter, stirring gently. 8. Pour the batter into a well-greased and floured 7″ x 12″ or 9″ x 9″ cake pan. Strawberry shortcake ready to be eaten. *More-with-Less Cookbook, Doris Janzen Longacre, Copyright 2000, Herald Press, Scottdale, PA, p. 282. If there were a fruity harbinger of summer, the strawberry would be my pick. Here in Ohio’s Amish country, we know it’s summer for sure when the strawberries ripen. I for one couldn’t be happier. I love strawberries, especially the homegrown ones. They just seem to taste better, are sweeter and juicier than those off-season berries imported from some foreign place like California. There are many ways to enjoy the delectable little fruit. I can eat these fresh picked strawberries individually by separating them from their pixy green cap, plop them on my cereal, bathe them in a bowl of skim milk or in a fresh strawberry pie. 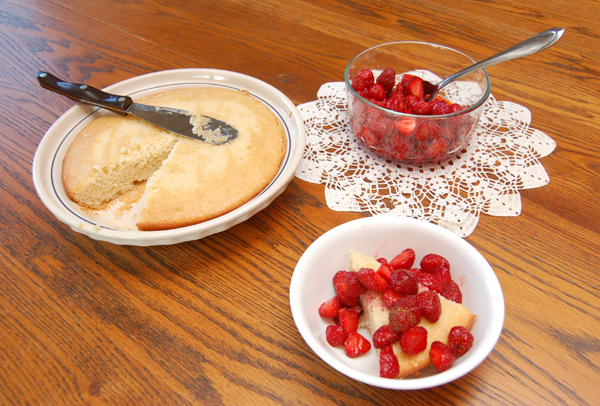 As good as those all may sound, my favorite strawberry treat is my wife’s incredible shortcake. I pile the ripe berries high on top of this wonderfully textured and even better tasting delight. Save the whipped cream. I use milk on my strawberry shortcake. Strawberries are summer’s first fruit, an edible sign that there are many more fruitful treasures to come, apples, peaches, pears, raspberries and watermelon to name a few. Perhaps that is the real reason I savor the luscious red berries so much. Strawberry time equals summertime. Youngsters patiently sit by the roadside with a wagon or small table loaded with quart baskets bulging with fire engine red berries picked just that morning. It usually doesn’t take them long to sell out. Strawberries, the only fruit with its seeds on the outside, are finicky to grow. In this climate, they have to be almost babied. Strawberries are susceptible to hard winter freezes, late spring frosts that damage the tender blossoms, too much rain, not enough rain, hail, mold and mildew, and hungry birds and critters. I inherited my love of strawberries from my father. Dad loved to round up as many of his willing offspring as he could and head to a patch often miles away just to save a little money. The berries were cheaper if you picked them. When we got home, the family fun continued. We helped Mom cap the berries, meaning we removed their contrasting green stem. Mom would sprinkle them with a little sugar, and then pummel them with a potato masher. That method blended the berries together in a tasty, sweet slurry, half juice, half berries, that we poured over those store-bought round shortcakes. The cakes soaked up the juice like a sponge. We always had the option of adding whipped cream or ice cream to compete the marvelous, well-earned dessert. Of course, all the berries weren’t eaten fresh. 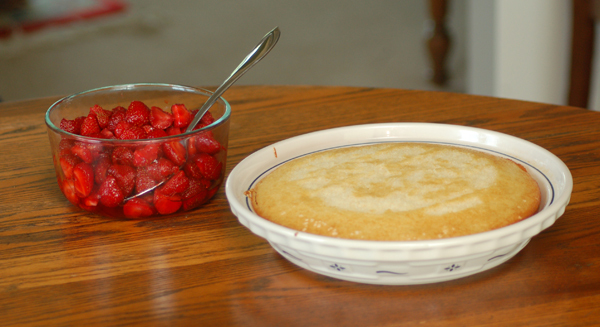 We froze some for later in the year, and made strawberry jam, too. The jam was good, the memories better. I realize that the benefits of summer go far beyond fresh strawberries. The extended daylight hours more than balance out those long, cold nights of winter. Just a few warm days strung together, and the three feet of snow that we had in February alone is long forgotten. It is precisely those warm days and nights, coupled with occasional rains that help create a successful strawberry harvest. I am more than happy that summer weather has arrived. To have strawberries as the season’s first fruit is a delicious bonus. This buggy, which was used for display at a bed and breakfast, received heavy damage from the high winds. Around 2:30 p.m. on Saturday, June 5, 2010, the National Weather Service issued a Tornado Warning for Holmes County, the heart of the world’s largest Amish population. Sirens sounded as the storm rapidly approached. As a Skywarn spotter, I scanned the sky from the safety of my home. As the rain intensified, the sky looked ominous, and the sirens sounded again. However, it appeared that the worst of the storm had gone south of me. A friend alerted me to possible damage in the Berlin area. I grabbed my camera, put on my waterproof shoes and headed south. I didn’t get very far. Fallen trees only two miles south of my home blocked the road. The fierce winds had ravaged old-growth woods behind a friend of mine’s home west of Berlin. A few homes were slightly damaged, a shed was completely destroyed and many trees were toppled. I followed the damage into the west side of Berlin, where again trees were down, some laying in opposite directions. A home had the upper half of a large tree on its roof and the wind sent a limb through the roof of a nearby motel. The next damage was east of Berlin near Hiland High School. Much of the damage there was from straight-line winds. Roofs were damaged; metal storage buildings buckled and signs were blown onto cars, damaging eight vehicles. Fortunately on one was injured. Firefighters spotted a funnel cloud west of Walnut Creek, where the first official touchdown was recorded. A large garage at a bed and breakfast was destroyed. The storm continued east-southeast through Walnut Creek Township. A combination of straight-line winds and tornado winds downed trees, and damaged sheds and two houses near Walnut Creek, and then hit metal storage buildings south of Walnut Creek. 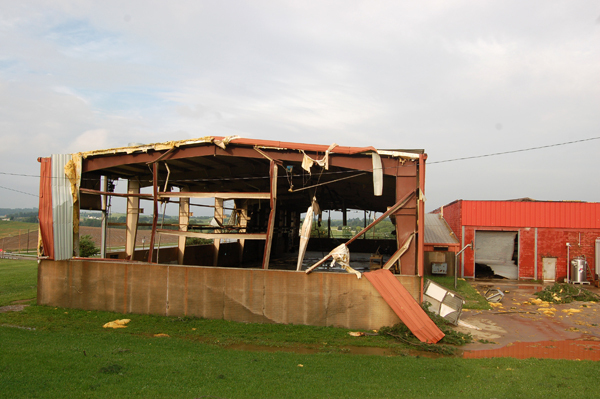 The tornado touched down again at Gerber Valley Farms on CR 144 southeast of Walnut Creek where it damaged two barns. 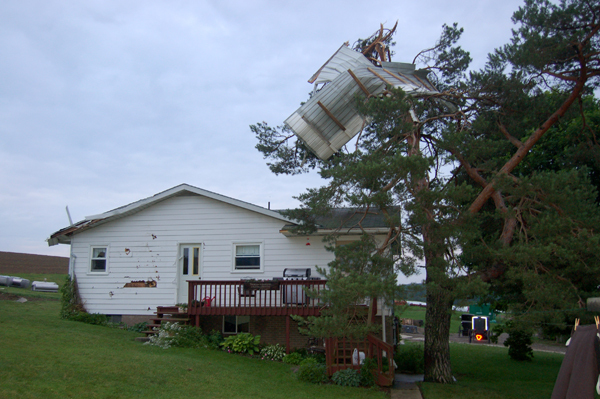 The tornado did minor damage to a few homes on a township road near the county line. Once the tornado passed into Tuscarawas County at Sugarcreek, it intensified into an EF-1 tornado, according the Pittsburgh office of the National Weather Service, which has jurisdiction for Tuscarawas County and points east. They estimated the tornado winds at 95 m.p.h. The tornado did major damage to Skyline Mobile Home Company on SR 93 north and to a home across the road. Several large trees were toppled. 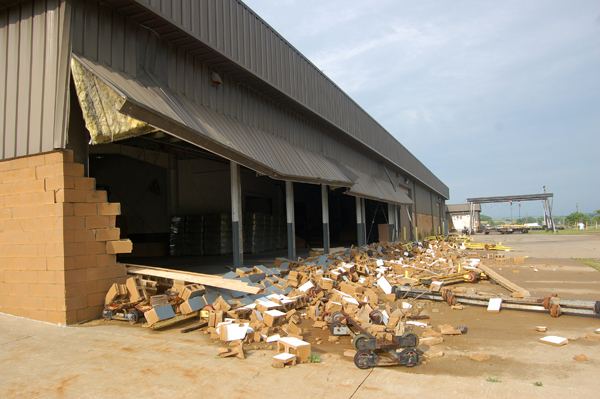 From there, the storm hit Uhrden Corporation and Zinck’s Fabric warehouse on the northeast side of Sugarcreek. It crossed the flooded Sugar Creek, causing heavy damage to both the old and new sewer treatment plant buildings of the village. Just east of there it hit a home and caused major damage to Sugarcreek Pallet. The tornado continued east, striking four homes along SR 39 on the eastern edge of Sugarcreek. All four had roof damage. The tornado crossed SR 39, hit another industrial building and destroyed a large barn on the Lorenz farm south of Dutch Valley Restaurant. At that point, the tornado lifted. In all, I spent five hours taking pictures. 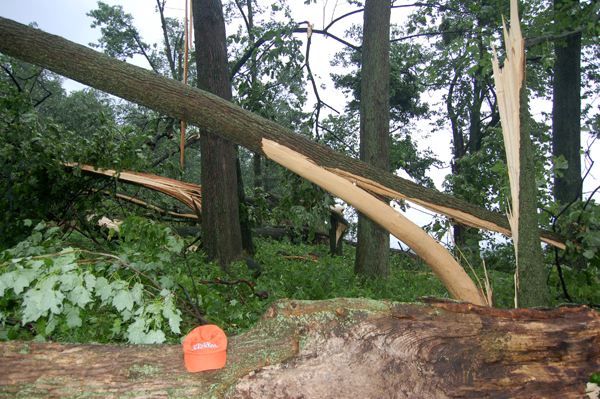 The shots below are representative of the damage that occurred in the path of this storm. Old-growth trees were splintered and tossed like sticks west of Berlin, OH. 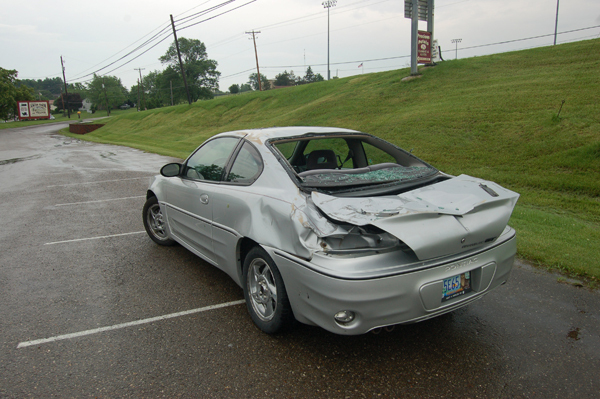 This was one of several cars damaged by a large sign that was blown onto them east of Berlin. High winds destroyed this garage halfway between Berlin and Walnut Creek, OH. The tornado hit at the Robert J. Yoder farm near Walnut Creek, OH. Neighbors and workers began replacing the roof of this broiler house near Walnut Creek shortly after the tornado hit. 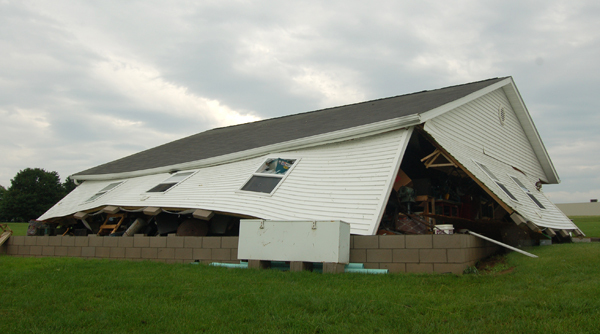 The tornado buckled the south wall at Skyline Mobile Homes, Sugarcreek, OH. The tornado peeled much of the roof off Skyline Mobile Homes, Sugarcreek, OH. 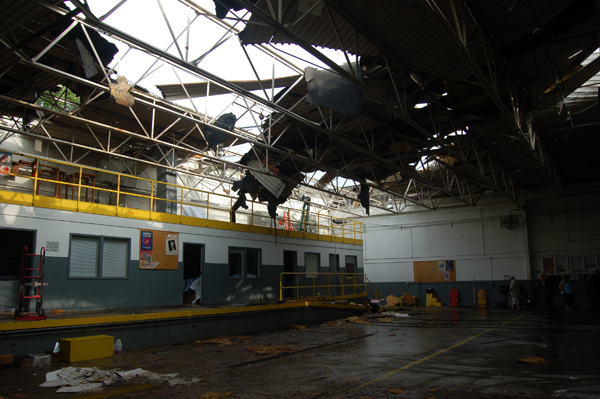 The tornado blew out every wall of the north section of Uhrden Company, Sugarcreek, OH. 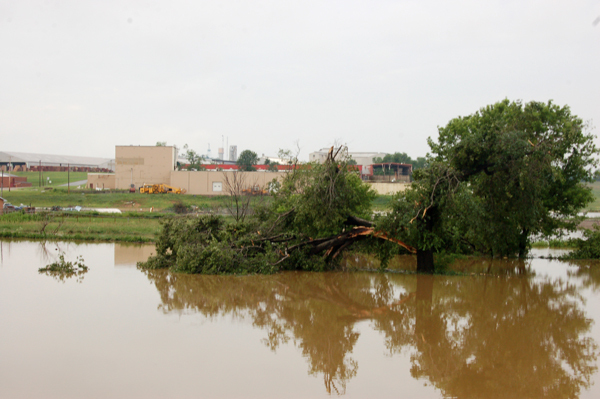 Flooding in Sugarcreek, OH was a problem both before and after the tornado hit the buildings in the background and the tree in the water. 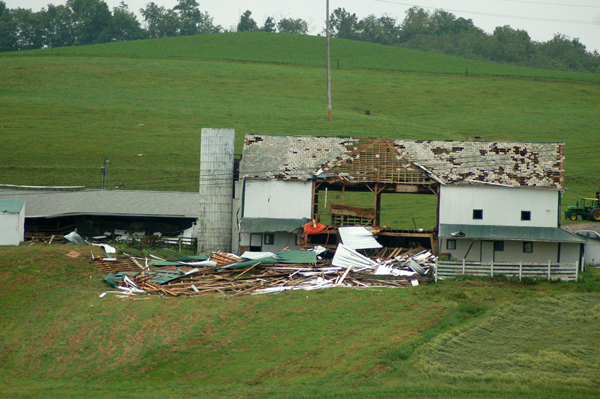 The tornado destroyed the main barn on the Lorenz farm east of Sugarcreek, OH. 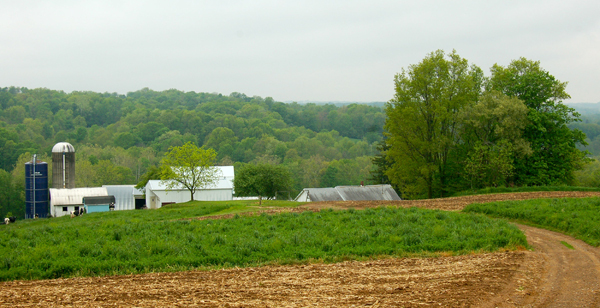 Bobby Hershberger's farm in Paint Valley west of Millersburg, OH. A brief glance at Bobby Hershberger’s hands, and you know his profession. Crinkled, calloused, chapped, all the marks of a born-again dairy farmer. Not yet 50, his thick fingers belie the rest of his body. His steely eyes still sparkle, even on a gray day in Ohio’s Amish country. His rutty smile foretells his honesty, integrity, and dedication to farm, family and faith. Modest as the day is long, Hershberger loves dairy farming. He must. He has spent his entire life milking cows, plowing ground, seeding fields, mowing hay, picking corn, feeding livestock, caring for family, serving church and community. On good days he only works eight hours or so. On really good days, he works twice that amount. Such is the life of a dedicated dairyman. With his equally dedicated wife, Beth, at his side, Hershberger has made it all these years, even milking just 30 Holsteins, not exactly a mega farm. The Hershberger’s also operate Pine Loft Bed and Breakfast out of their home high on a hill that overlooks Hershberger’s home farm in Monroe Township’s Paint Valley west of Millersburg, the county seat in Holmes County. “Tilling 110 acres and milking just 30 cows, there are Amish who have bigger farms,” he said humbly. The combination of his demeanor and his gentleness tells even a visitor that there is no malice in this man. There are 40 years of thought, vision and compassion, however. Hershberger began milking cows with his entire family. He then went 50/50 with his father, and for the last 22 years, he has been on his own. And that has worn him down. In his lifetime of milking, Hershberger has seen a gradual but significant transition in the dairy industry. 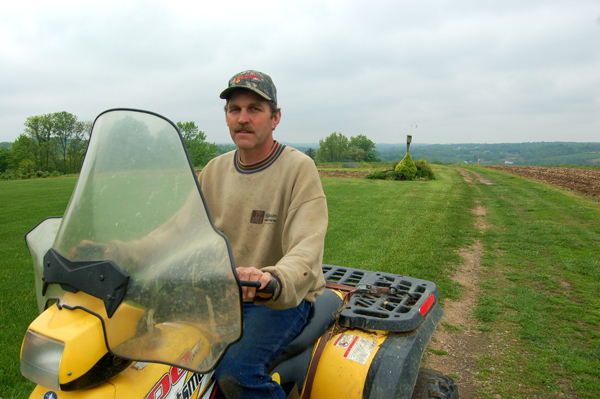 When Hershberger started helping on the family farm, farming was slower paced. Cooperation out-muscled competition, and income was much more stable, thanks in part to government milk subsidies. But much of that has changed. In the last decade or so, the change has become more an economic stampede of sorts. To put it simply, it’s either get run over by the big guys, or step out of the way. As hard of a decision as it was, the Hershberger’s have chosen the latter. This summer they will sell their herd, effectively ending an agricultural aspect that has kept the couple close to home 24 hours a day, seven days a week. Holsteins, after all, don’t take vacations, so neither do their owners. As the couple looked ahead and weighed their options, the decision to stop milking became pretty clear. Day in and day out, milking cows is as grueling as it is satisfying. “The decision really came down to this,” Bobby explained. “Either we had to expand or get out.” They loved their life on the farm. But they also knew that there was more to life than milking cows twice a day until you physically couldn’t do it any more. “I have enjoyed being able to work from home,” he reflected, “but when you milk, you are always at home.” Hershberger said after all these years he and his wife are simply tired. Last year was an especially horrible year for farmers, according to Hershberger. In a way, that made their decision to stop milking much easier. Bobby saw staying in the dairy business as a sinking hole. “With prices down, you work seven days a week and end up having nothing to show for it,” he said dejectedly. Hershberger said that the only way to continue as a dairy farmer was to expand operations. To do that, he would have to purchase or rent more land, which would require him to buy bigger, better, and more expensive farm equipment and buildings, and hire farmhands. All of that meant borrowing more money, and that just wasn’t something he and Beth wanted to do at this stage in their lives. Hershberger wanted to be clear that this was a personal decision. He doesn’t begrudge anyone. Dedicated farmer that he is, he wants the industry to succeed. But he sees the small farmer like himself being squeezed by the system more and more. Hershberger is a practical man. “Being a dairy farmer has gone from a way of life to a way of making a living for big business,” he said. With that, the strong, humble man’s voice tailed off, almost in a quiet relief of the decision he had made to stop milking cows. Hershberger said he would continue to farm the fields. Bobby Hershberger on his way home from the barn. This story originally appeared in the Farm and Dairy tab of the Holmes County Bargain Hunter.